1. Research the test not the outcomes. Do. Not. Google. Symptoms. Trust me on this one and if you want to learn from my mistake, Google “MRI early morning headaches”. When I saw what popped up I could not breathe much less focus on preparing Claire for the MRI. After my husband Bennett calmed me down, I went back to Google and found some very helpful age appropriate videos geared towards children and their first MRI. 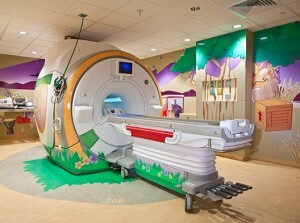 I was able to research the risks of MRIs in children, which vary by age and whether or not the child has to be sedated. In addition to having Claire watch the videos, we talked to her about the test and what it might show that could help manage her headaches. 2. Call in favors if you can. 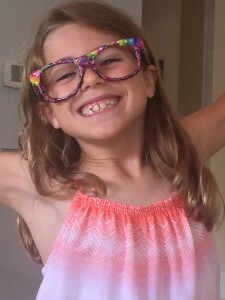 When our pediatrician told us the MRI scheduler would contact us ‘soon’ to schedule the test, I imagined soon really meant we would be waiting a while to actually have the MRI. I know myself well enough to recognize my shelf life of not knowing if my child has a potentially serious condition is around 48 hours. After that I cannot promise I will not completely lose it. Luckily Bennett was able to speed up the process by reaching out to a friend who arranged for Claire to fill a cancelled appointment the next day. We rarely do this but desperate parents call for desperate measures. 3. Consult with your village. Everyone has a handful of people in their lives they call for advice on medical issues. For unknown reasons, I am that person for some of my friends (maybe not after this blog). For me, I reached out to several people including a friend who was once a nurse practitioner for a pediatric neurologist. She also happens to be a fellow preemie mom who has always helped with Hill’s medical issues. She didn’t sugar coat what was going on but calmed me down and gave me a step-by-step plan on how to move forward as opposed to remaining frozen with fear. 4. Keep your child’s teacher in the loop. At the suggestion of Claire’s pediatrician, we told her teacher and school nurse what was going on. If she takes ibuprofen and lies down for a few minutes at the first hint of a headache, it is much less severe. At first I hesitated to cause this type of inconvenience for the school but realized that it was best for Claire. If we picked the right school for our children, they would support us. One week and half-dozen headaches later, they are happily working with us until we can figure this out. 5. Visualize the best. When your child is ill and you don’t know why, it is extremely difficult to not let your mind go to the dark place of thinking it is caused by a serious illness. I took my own advice this week that I have said to friends countless times: you will be the first to know when something is seriously wrong. Stressing and obsessing over the ‘what ifs’ is pointless and could have a negative impact on your own health. Visualizing that your child will be fine won’t change the outcome but it will bridge the gap between today and the day of the test results. By the time the MRI scheduler called to make Claire’s appointment we already had the test results. Thankfully, her scan was completely clear of any scary health issues that could have caused her headaches. We can now shift our focus to figuring out what is causing them and finding a long-term solution.